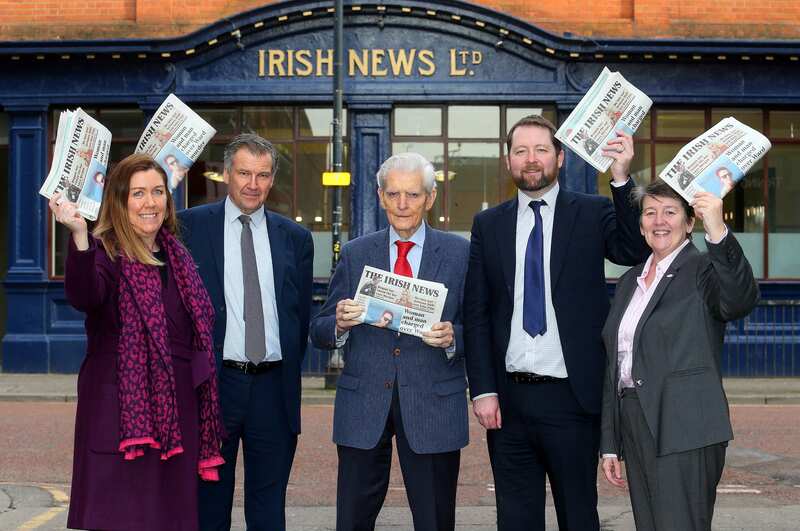 Pictured from left to right, Bronagh Luke, Head of Corporate Marketing at the Henderson Group, Irish News editor Noel Doran, Irish News chairman Jim Fitzpatrick, The Commissioner for Older People for Northern Ireland, Eddie Lynch and Age NI CEO, Linda Robinson at the launch the Neighbourhood News initiative. The Irish News has joined forces with local charitable organisations and businesses to encourage people to be more neighbourly and call in on older people in their communities. The Neighbourhood News Initiative will run from Monday 25 February to Sunday 03 March and is inviting shoppers to pick up a complimentary neighbour copy of the Irish News each day from their local SPAR, which should then be shared with an elderly neighbour in a bid to make better connections with older people in their communities. There are 285,000 older people over the age of 65 living in Northern Ireland, a figure that is predicted to grow to 608,493 for 60+ years by 2039*. 54% of those over 65 years old have never accessed the internet, 4.5% live in communal establishments, and 78,101 older people live alone*. The initiative has been endorsed by Age NI and the Commissioner for Older People and is supported by SPAR NI. The Commissioner for Older People for Northern Ireland, Eddie Lynch, said; “Loneliness is one of the most significant issues for older people in Northern Ireland. Research studies have shown that feelings of loneliness can be as bad for your health as smoking 15 cigarettes a day. In addition, people who are very lonely are twice as likely to develop Alzheimer’s disease, the most common form of dementia, as those who aren’t lonely at all. Bronagh Luke, Head of Corporate Marketing at the Henderson Group, owners of the SPAR brand in Northern Ireland added; “Our SPAR stores are situated in the heart of every community in Northern Ireland and, for older people in the community, can often be an important hub of social interaction. Linda Robinson, CEO, Age NI said; “We are absolutely delighted to be involved in this initiative and commend the Irish News for raising awareness of the issues affecting older people, especially around loneliness and isolation, which we know is an increasing problem for many, but particularly for the older generation. “Sadly, it’s something we hear every day from the older people who contact us or use our services - that they don’t have anyone to talk to or someone to share their problems with. Some can even go days without seeing or speaking to anyone. For more information on the initiative, visit www.irishnews.com/neighbourhoodnews and www.spar-ni.co.uk to find a local SPAR store. Information on the services provided by Age NI and the Commissioner for Older People for Northern Ireland can be found via www.ageuk.org.uk/northern-ireland and www.copni.org.